Made in Japan from quality ceramic, this sake bottle and cup set comes with a distinctive sake bottle and four matching sake cups for enjoying your favorite sake with friends in style. 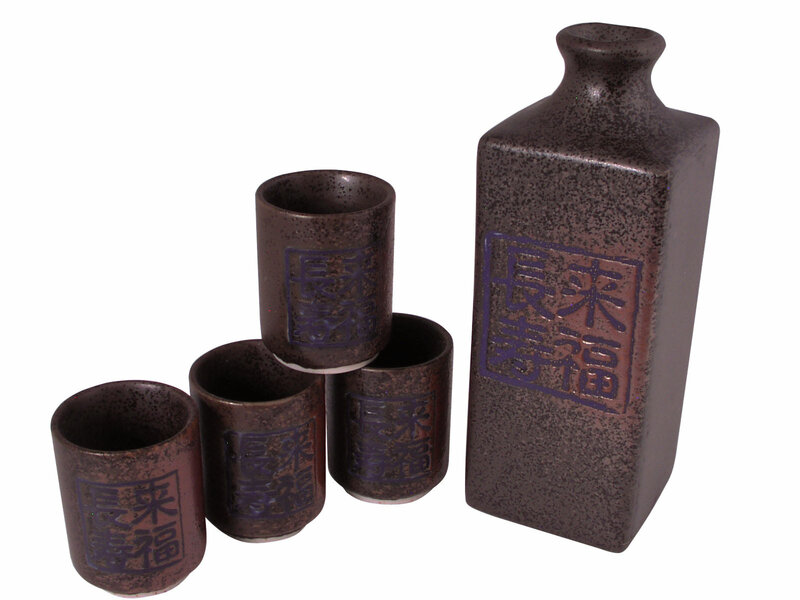 Featuring a unique rectangular shape, the sake jug in this sake bottle and cup set features a one of a kind contemporary earthen red with a touch of dark brown and has the kanji characters “longevity and beckoning luck” in an elegant mauve dark blue. Black speckles against the dark brown and red background creates visual texture and a unique look. Featuring a smooth matt finish, this sake bottle and cup set is at once simple yet elegant. Designed with a raise neck and rounded rim to facilitate the serving of sake, the sake bottle in the sake serving set is great for serving both warmed and chilled sake. This charming set makes a wonderful gift for sake lovers and is a great way to send loved ones well wishes for longevity and luck. Hand wash is recommended for this item.